One of my friends at work was concerned about us living on the boat and would it be a little boring for us. His concern was Brian and I are very active people and what exactly were we going to do all day long. I certainly appreciated his concern but like I said to him then, our boat is our home and there are always home projects that need to be done. 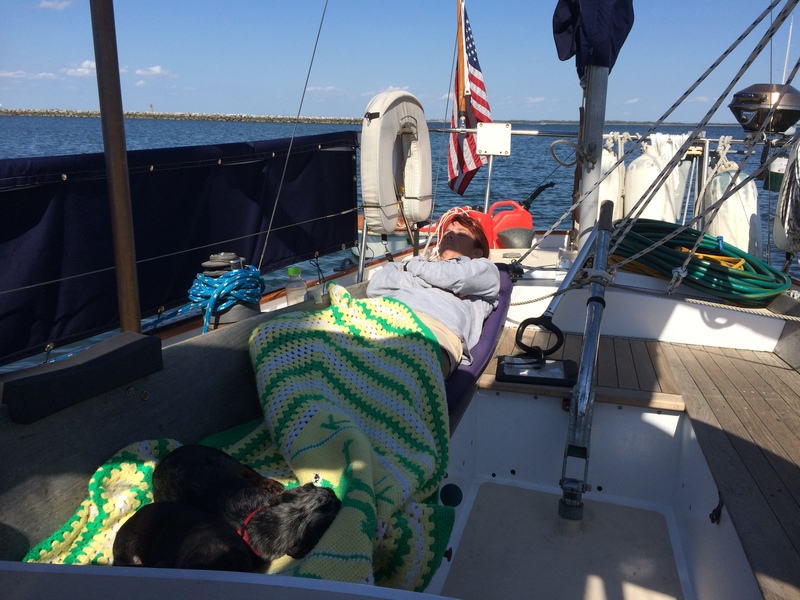 Today was a down day because we are awaiting a front to go through on Tuesday so we can pick up anchor on Wednesday and sail the coast of New Jersey to Cape May. With that said, we needed to do some home repairs, housework and oh yeah, deal with 2 little dogs and get the exercise we needed! Brian noticed a leak in our hot water heater which needed to be addressed because we have limited water storage and any water leaking into the bilge is a major worry. Thankfully, that was an easy fix but it certainly had Brian working on his yoga poses while trying to fit in the locker under the galley sink to fix the leak. Hot was is back! I spent my time organizing the head (the bathroom for all landlubbers). Yes, I had the easier job. But at least I know here everything is again. To put a few things in perspective about how we spend our day, I thought I would detail 2 of the things we did today. Dogs needed a nature break on the beach and we needed to go grocery shopping. When we were living in Bridgeport, the back door was always open for the dogs and when they wanted to go to the bathroom, they just needed to run down the stairs, very little effort on our part. Well, to dingy the dogs to shore is a process and the end result is another hour gone from the day. We anchored about 1/2 mile from shore and in Sandy Hook we can only go to shore at low tide, because there is not much beach at high tide. Both dogs need their life jackets, Pickles needs a towel to sit on, I need my life jacket in the dingy. I need to make sure we get there and back safely, not always a pretty site! Once on the beach, I need to pull Boo Radley (the dingy) up on the beach so she does not wash away. Walk the dogs up and down the beach until the perfect spot is found, during the entire time making sure Phinneus does not eat anything that will make him sick, mainly dead crabs at this beach. Once all dogs are happy, load everyone back into the dingy and push the dingy back in the water and hopefully make it back to Scout without looking like a fool while coming aside the boat. Because we sit in our cockpit and watch the other cruisers try to not hit their boat with the dingy, we know they are doing the same to us. Brian and I also needed to go grocery shopping. The store is about a mile from the marina. So off we go in the dingy again, about a mile from boat to marina. Tie up the dingy, make the mile walk to the store, and then figure out a new store and their gluten-free options. Load everything into the backpacks, oh yeah, did I mention no cardboard can come on board because of potential insect issues? So anything in a box needed to be opened and the cardboard left behind. Walk back another mile to the dingy dock, and then back to the boat! Yep, there went another 1 1/2 hour! Through all of this, not once am I complaining. This is exactly what we thought it was going to be like and both of us feel so very lucky to have this opportunity. We just look at each other and feel we need to pinch ourselves in how very lucky we are! For all of my friends who need to do last dog walks tonight, and it takes 10 minutes, please realize Phin and Pickles have to either pee on the bow pee pad or endure another dingy ride! Good news is that the water is warmer than the air temperature.